This is a small guide with a few links thrown in as an attempt to inform both new and old radio users as to the ways and means of DXing (long distance contacts) on both legal FM UK/EU bands and SSB (11m). SSB operators usually use the “illegal” frequencies that are in between these 2 bands normally centered round the international calling freq of 27.555 USB. The normal mode used for DX in the UK is USB (Upper SideBand). The other SSB mode available is LSB (Lower SideBand) this is not usually used in the UK. It is however used in the USA and AUSTRALIA for instance. AM is also an available mode of transmission but is only used legally by a few EU countries and not normally used (or legal) in the UK, again it is used in the USA as opposed to FM (which is illegal!). Generally certain modes of transmission are used for certain frequencies or blocks of frequencies. FM for the two legal bands and USB for the freq in between and below the two legal blocks of 40 channels. What we refer to as 11 meters or freeband is generally considered to cover 26 MHz to 28 MHz. There are a few types of CB type radios available to you. Standard legal 40 or 80 channel 4w FM transceivers. New style 10m radios (28 MHz-29.7 MHz) with AM/FM/SSB that can be easily modified to cover 25 MHz to 30MHz (usually) and some even have a built in frequency counter and power output sometimes as high as 100w. 25 MHz – 30 MHz of course includes the legal EU and 27/81 frequencies as well as 27.555 MHz etc. 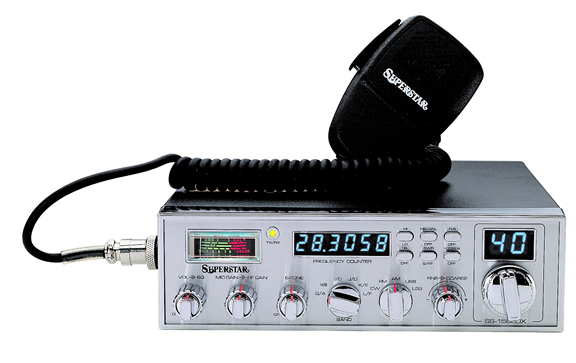 Shown here on the right, a typical modern day 10/11m band radio, the Superstar 158-EDX. It is modelled around the famous Cobra 148 style radio from the eighties. The flatter the landscape between you and your contact the less your signal is broken down, therefore staying stronger at the receiving end. Which leads on to the fact that water has virtually no obstruction so signals pass over it easily. The higher you are (you guessed it) the less obstruction there is, this also means you can effectively see further round the planet, remember signals travel via line of sight and then there is “SKIP” a phenomenon that allows long distance communications. This is caused when solar magnetic radiation emanating from sunspots (magnetic storms on the sun) charges the Earth’s ionosphere causing it to act like a mirror for radio signals. It is possible for the signals to bounce off the charged ionosphere and end up 100 miles away, or up to 12,000 miles away on the other side of the world. The ionosphere is between 30-250 miles above the earths surface. Low power stations in theory can still DX, however with all the high powered stations they are sometimes drowned out by the higher powered stations. Some serious DX stations run hundreds of watts and the odd few have over 1000w or more to play with. Sunspots which cause skip are on an 11 year cycle (currently cycle 24), therefore band conditions go on a 11 year cycle. At 2007 we are just past the lowest activity part of the cycle. The cycle will peak in 2012. “Skip” isn’t always happening. Some days it is very strong and you can talk all over the world. Other days there is no skip and you can only talk line of sight. It completely depends on sunspot intensity on the surface of the sun. As we near the peak in 2012, we will see increased conditions lasting for longer periods. The best thing you can do is turn on your radio and listen for conditions for yourself. The 1st part is your division number – this is the prefix assigned to your particular country or division. There are currently 344 division numbers in existence. (You will find a full list of Division numbers on this site here). The 2nd part is there to identify your group or personal initials. “Tango Mike” is fairly self explanatory I hope. yourself to identify you from other group members. The CQ call is designed to allow the stations receiving you time to tune you in and have the maximum chance of receiving your call sign (country/group/station). CQ means “seeking you” or “looking for”, DX means “long distance”. Once you have moved to your stated QSY freq, in this case 27.535. You need to let everyone know you are there and ready to make contact, again a short call with your call sign is best. When making or looking for a long distance contact on FM you can use your call sign, but it may be sometimes easier to use a handle/operator name. With many ongoing conversations on FM the operators are not up to speed with DX and its slightly different ways. (This doesnâ€™t mean not to use it though). Most operators on and around 27.555 MHz are there for mainly DX contacts so it is best to use a call sign. Once contact has been made on the calling freq PLEASE change freq (QSY) to a different channel to continue your conversation. After you have had a good chat, exchanged operating conditions (talked about the type of rig/equipment you are using etc) it may arise to send a QSL card to each other to confirm your contact. This is normally done with the use of a PO Box as to maintain a safe environment. It is much better not to transmit your home details if you are running freeband. QSL means to exchange written confirmation of your contact, normally by using a postcard sized card with your details and radio report etc on it. The term QSL is one of many Q codes. There are only a few Q codes regularly used and are well worth learning for DX use. A good list can be found within this site here. Most clubs offer group and/or individual QSL cards and a shared PO Box with redirection to your home address for a minimal fee. QSL cards and PO Box are both available to you as a Tango Mike member. Also E QSL is available online as an alternative that Tango Mike will be setting up in the future. Once exchanging QSL cards ensure that you have addressed the envelope in the correct format for the destination country, for example some countries use a ZIP code, such as the United States. This is similar to our UK postcode but comprises of purely numbers, no letters. Details for addressing mail correctly can usually be found by doing a quick search on Google for the destination countries post office. If sending a card to a rare country then please be discrete in labeling your QSL package. Some countries may confiscate cards for illegal radio use so it’s best not to put the call sign on the package in those circumstances although in most destinations it is fine to do so. It is usually very handy to keep an organized diary of your contacts. Including: when, what freq, what mode, what time, QSL received/Sent, their location and working conditions etc. Much easier to look back upon a log book than quick notes in a pad. You can purchase proper log books for amateur radio that can be used for 11m contacts or alternatively free QSL Log file software is available on the Internet. Unless communications are always with another station within the same time zone as you, it is considered more convenient to work in Universal (UT) or Zulu (Z) time since in many cases the transmitter and receiver are operating in different local time zones. Universal time is the same as the Greenwich Mean Time (GMT). A few other links for a different perspective and more in depth look at 11m and DX. IT IS WORTH NOTING THAT ANYTHING OTHER THAN THE LEGAL 4 Watt 40/80ch FM TRANSCEIVERS ARE ILLEGAL TO OPERATE IN THE UK. This is a guideline post. There are NO rules for freeband and this is intended to help, nothing more. (Some groups may have their own rules, which are usually explained upon acceptance of membership).